There are many ways to get in and out of the pool. By default, you head to the pool steps on the shallow part of the pool. But if you are already on the other side, there is no better way to climb up but through the help of built-in pool handrail. A pool handrail is one of the most essential parts of a pool. It should be present on the side of the pool steps and on other access areas of the pool. Swimming pool handrail are something that you need to put a good thought on when buying because it means a lot when it comes to your safety. In fact, if you're planning on building a pool in your own backyard, here are some more things you should keep in mind when getting a good handrail and we've also reviewed the best rails you can buy. ​Americans with Disabilities Act (ADA) compliance : The Act requires handrails to be installed at pool rails, ramped entries and transfer walls. If you are planning on installing a pool or spa set in your own home, then you should be wary of the inclusions of this act. The ADA requirements : According to the ADA, a ramped entry must include at least two handrails, with a width of 33 to 38 inches between them to allow the safe passage of one to two persons at the same time. The height should be 34 to 38 inches, and the diameter of the handrail should be between 1 1/4 and 1 1/2 inches. Handrails are not required to extend below to the stationary water level. Different kinds of handrails : The commonly used pool handrails are the three-bend and four-bend handrails that are curved in a loop with one end of the rail attached to the pool deck and the loop end is extended over the water. Pool handrail maintenance : Just because it doesn't look as vital as the pool itself, doesn't mean that the pool handrail will not need some extra care, too. The pool water should be properly balanced to avoid the metal to corrode or rust. You can also remove the handrails from their installation points and clean with a phosphoric acid gel, like naval jelly and a plastic scouring pad. You can finish this well and apply a protective layer of car wax. 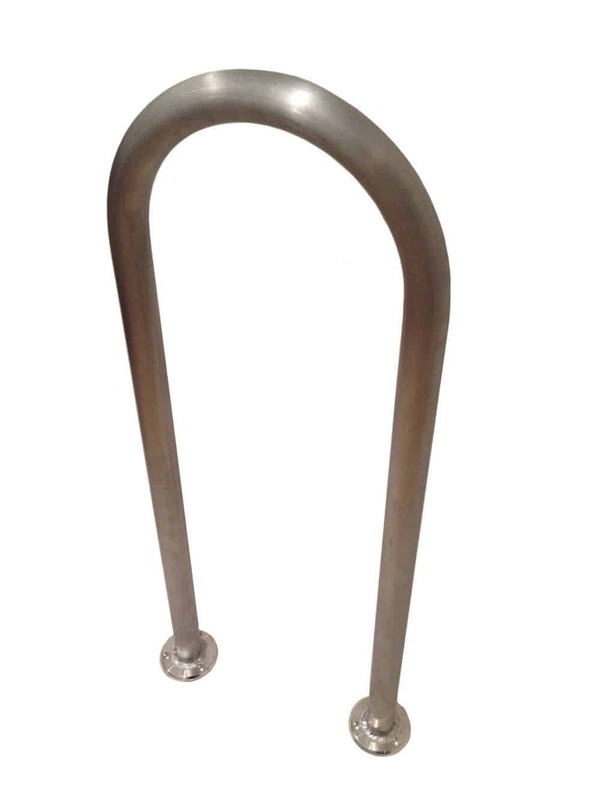 ​The stainless bolts are included in the set and are designed for extra security of your pool handrail. ​It is very easy to install. ​Only a hammer drill is needed for the fast and easy installation of the handrail. ​The base plate is thin which allows some flex in the handrail when force is exerted upon it. ​The dimensions of the product may vary on user preference and depending on the depth of the pool. There's really nothing negative about this product. The FibroPRO pool handrail deserves two thumbs up for its price and performance, you should really check this out. Although there can be some problems with the dimensions of the product, it is very well compliant with the ADA requirements. These rails are best used for short distances rather than for those pools with long entrance points. 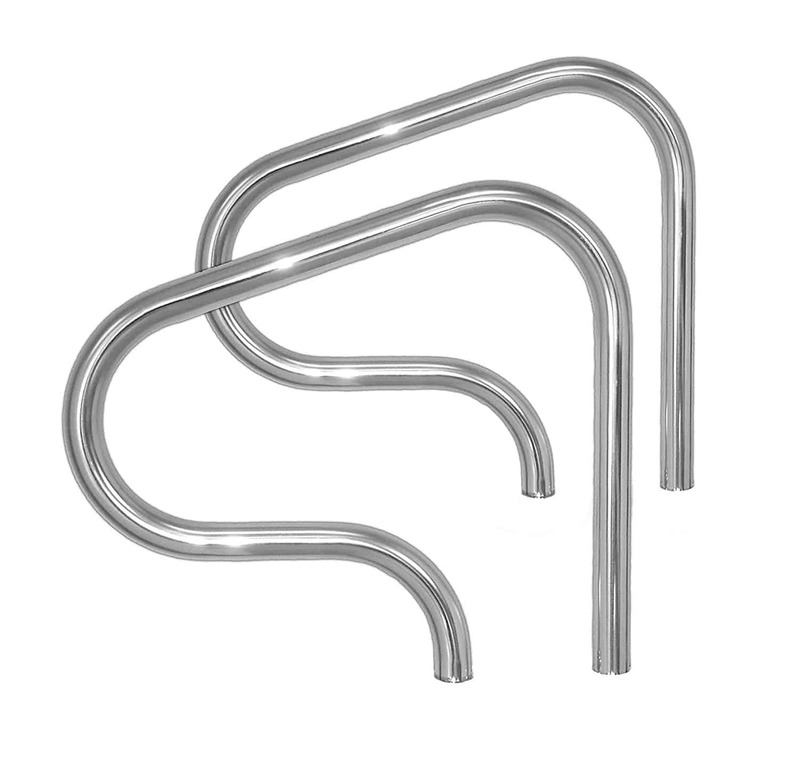 The Champlain Plastics swimming pool handrail is made from sturdy stainless steel that is specifically built for in-ground pools. Its dimensions are 50" x 38" x 9.5" and measures 1.9" in diameter. ​It is specifically designed for in-ground swimming pools. ​It is finished with a grayish stainless steel color which will complement your pool very much. ​It is made from stainless steel. It is sturdy and resistant to rust and corrosion. ​Not everything that you will need for the installation is included in the set. You will have to buy the rings and sockets to secure into the 3-inch holes in the concrete ground. 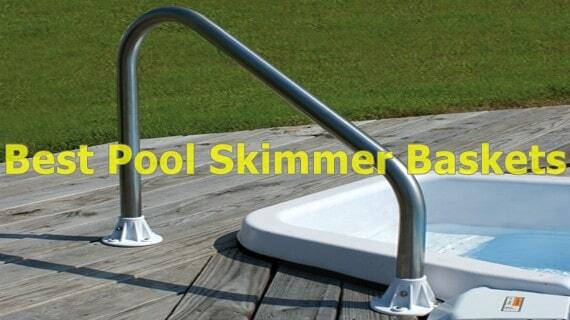 If you are looking for a pool handrail for your in-ground swimming pool, then this is the perfect one for you! It may be a little tricky to install because you would need to provide the fittings for it to become secured to the ground, but once it's done, it will certainly change the way you look at the security of going down your pool. The whole set includes one pair of handrails with can be installed 26 inches from one another. For new construction, you will need 2 bronze anchors (AS-100B) are required but are not included in the set. 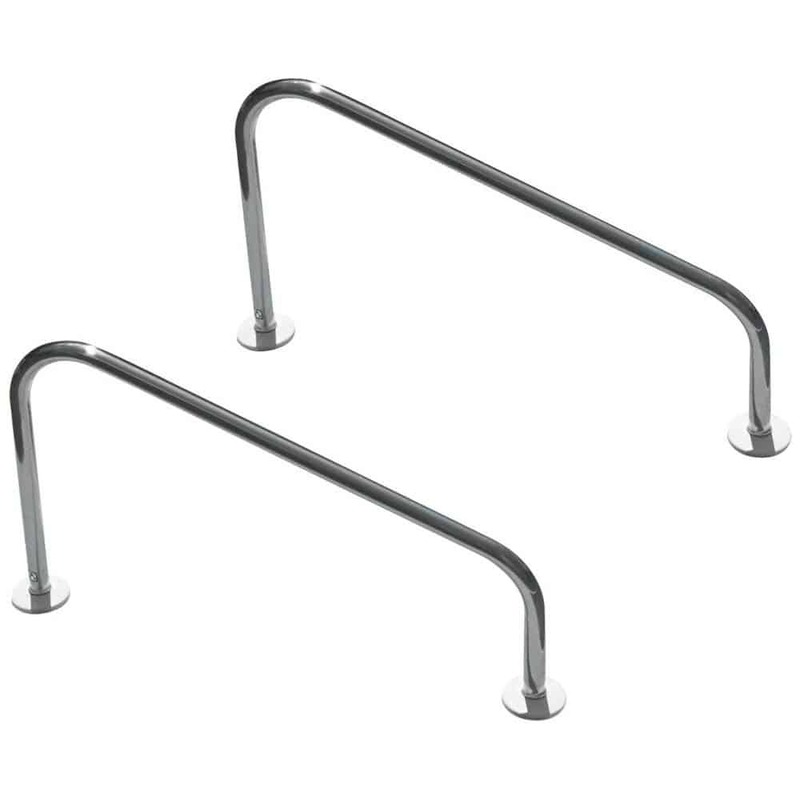 Two stainless steel escutcheons (EP100F) provide a clean finish to new ladders and rails and are also not included. It has a 0.049" wall thickness and 1.90-Inch outer diameter tubing. ​Perfect for small to medium-sized pools. ​It is made from stainless steel. ​It has a durable and sturdy finish. ​Great for residential or light commercial use. ​The handrails do not come with the fittings needed for the complete installation of the product. Overall, the S.R. Smith F4H-102 pool handrail looks excellent! Families love this because of its sturdy and attractive appearance. You can totally trust these handrails for safe entrance and exit in the pool. Although there are fittings that need to be obtained elsewhere, these are not that hard to find as it is commercially available anywhere. It won't be a problem to install this handrail once you have the tools needed to complete the set-up. ​It is designed specifically for deck-mounted swimming pools. ​It is made from quality stainless steel grade material. ​The rails are durable and sturdy. ​This may not be suitable for wood-mounted pool decks. ​The anchor sockets and escutcheons are sold separately. The S.R. Smith handrails for deck-mounted pools are perfectly designed for your deck-mounted residential pools. It is made from quality and graded stainless steel that gives the handrail its sturdy characteristic and resistant to corrosion and rusting. Although you would have to buy the sockets and escutcheons, it is something that a quick trip to the hardware store can fix. The Marine Fiberglass Direct Aluminum pool handrail measures 18 inches in height. It is made from high-quality 6063-T5 mill finish aluminum and the anchor pads will fit perfectly on your dock or pool deck. This can be used around either fresh water or salt water. This pool handrail is great for all types of outdoor marine, pool applications or in pool areas that you would want extra support. ​It is made from graded aluminum material. ​It is sturdy and durable. ​The handrails can be used for other pool applications - it can cater both salt and freshwater swimming pools. ​It's perfect for small to medium-sized pools. ​There are three anchor points on each pad. ​Aluminum material may corrode or oxidize over time. ​Extra care is needed for the maintenance of pool handrail. This pool handrail is perfect, aesthetically speaking, you are looking for a more different look for your swimming pool's entry and exit points. At the same time, it is great for small to medium-sized pool areas because of its compact yet safe size. 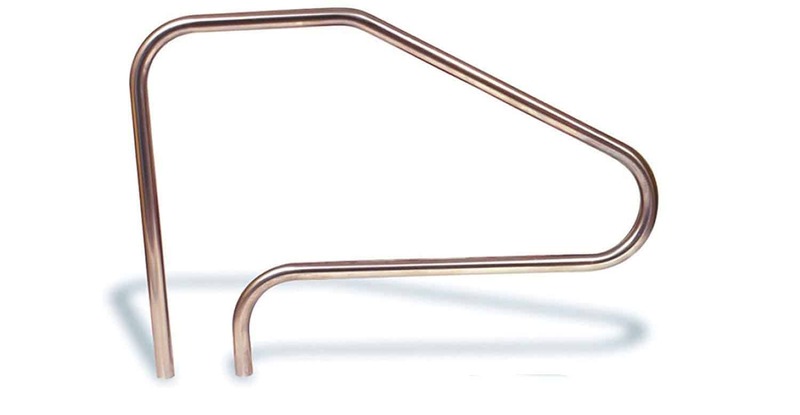 The Inter-Fab pool handrail set includes a pair of grab rails made of durable stainless steel 304. Its design is perfect for in-ground spas, pool entry areas or for pools with in-wall ladder-treads. It also a bright and gleaming stainless-steel finish with unbeatable strength and stability that will give you years of use with these handrails. It is designed to have 1.9 inches diameter and 0.049 wall thickness. The product also comes in different powder-coated colors: white, earth, and copper vein. ​This works well in residential or commercial installations. ​Sturdy and durable pool handrail. ​Made and coated with quality-grade materials that are incorporated to extend the service life of the rails. ​Available in different pool-flattering colors. ​Fittings and anchors are sold separately. ​It can be a little bit tricky to install. The Inter-Fab pool handrail stands out because these handrails are specifically designed for pools with deeper-than-the-usual pool step edges. The performance of this product is phenomenal - from its long service life to its overall durability, buying this for your pool will be very much worth it. It is also a major plus that these handrails are available in different colors, so if you are going for an aesthetically-pleasing look that won't compromise its primary function, then this one is for you. 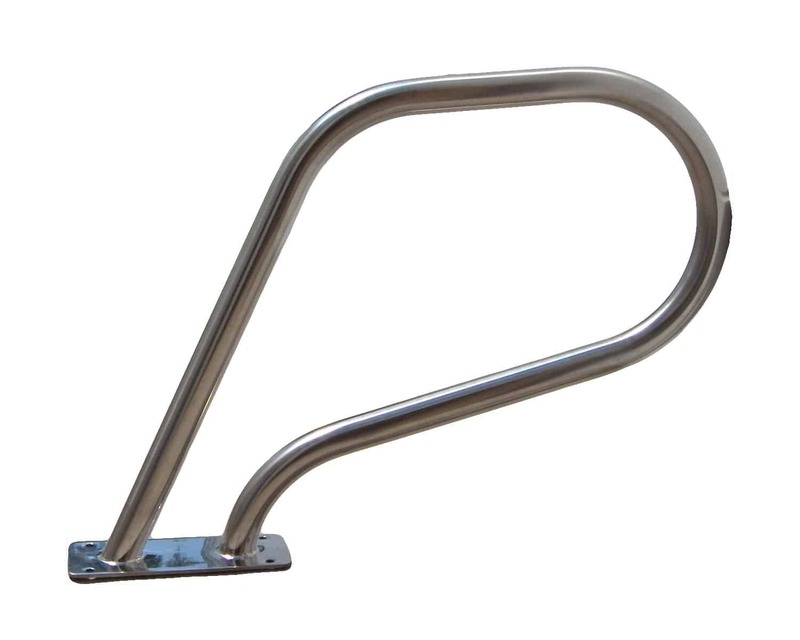 The Tiamat pool handrail and the ladder are made from 304-grade stainless steel and have a tubing with 1.90 inches outer diameter to secure your grip when you're pulling yourself in and out the pool. The anchors are spaced 20 inches apart and the overall height of the railing system is 24 inches. ​It has a handrail and a ladder for added support. ​This is perfect for poolside installations. ​It fits tightly and securely in your swimming pool. ​It comes with a 1-year warranty. ​The stainless steel may need extra care as it is prone to rust and corrosion. The Tiamat swimming pool ladder and handrail installation is perfect if you are looking for rails that will fit any poolside. The great thing is that this product comes with a one-year warranty which can extend your security about the performance of the product. S.R. 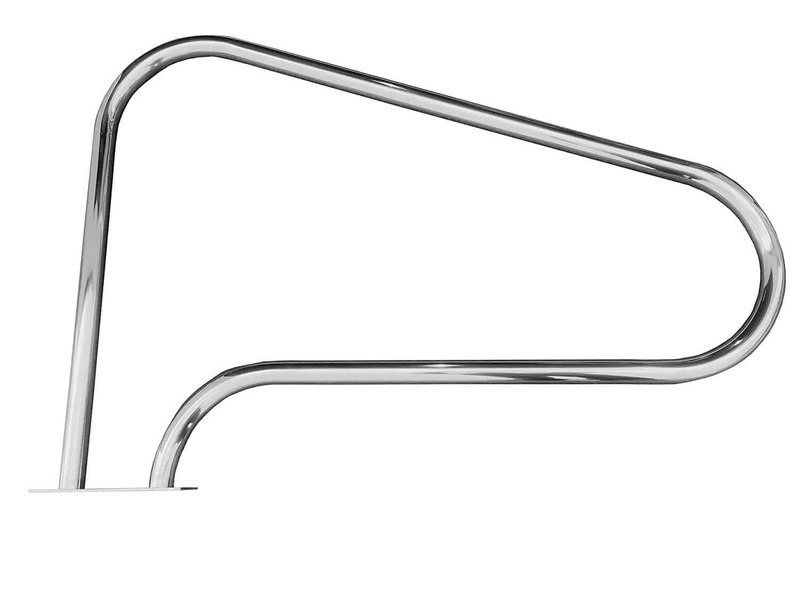 Smith's Spa Rail is stainless steel, ring handrail intended to increase safety by aiding spa users getting into and out of the spa. Four mounting bolts are required to secure this rail to the deck and should be selected according to your site requirements. No anchors are needed for this pool handrail. You will just need to drill directly into your pool deck. Its mounting plate is drilled for 3/8-inch bolts. The bolts, however, are not included in the set. It has 1 and 5/8-inch outer diameter for its tubing and its wall thickness is 0.049 inches. ​It already comes with a flat plate on the bottom with four holes for mounting. ​It can easily be installed. 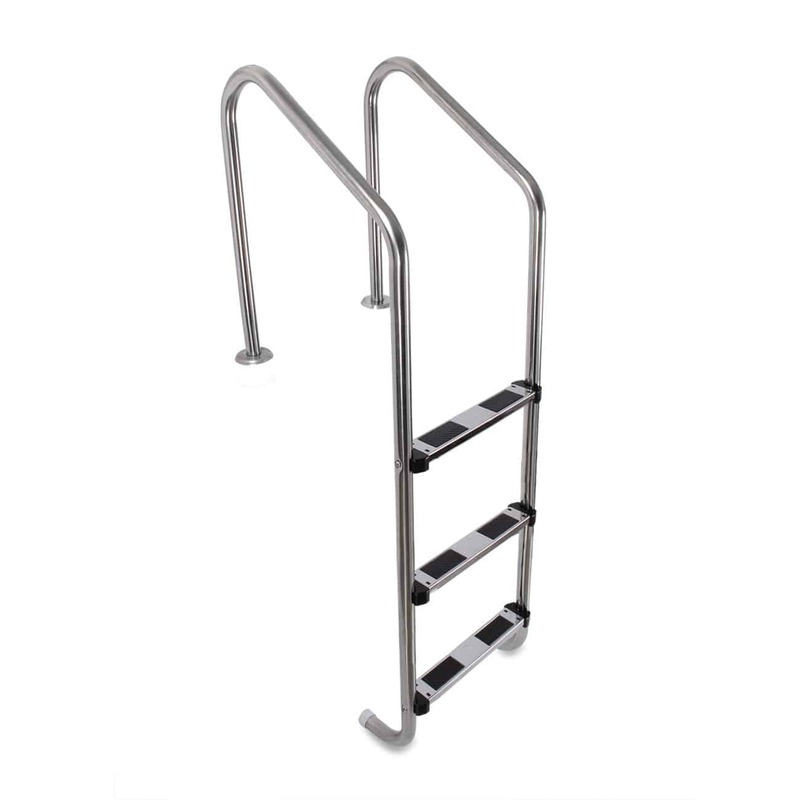 ​The handrails provide sturdy and safe entering and exiting to the pool area. ​You would have to buy the bolts for installation use. If you are not much of the person to do Do-It-Yourself installations, then this S.R. Smith pool handrail is for you! You do not have to drill so many holes as this product comes with a built-in drilled holes. All you have to do is to drill in the bolt installation and you are good to go. However, you would need to buy the bolts for installation use, but everything else that you will need for its easy installation is provided for you. This is perfect especially if you are the type of person who is not very much keen on working with hardware. The Swimming Pool Ladder is mounted on the edge of the pool for the swimmers up and down the ladder. 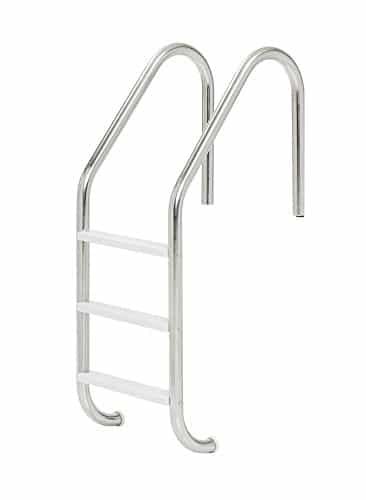 The features of 3-Step Swimming Pool Ladder is stainless-steel to ensure never rust construction and high impact resin safety steps. Handrail of the escalator is bent. Its shape is convenient for people to hold, no slipping. The series can be selected according to the needs of the escalator. Order this high-quality pool ladder for your home and enjoy an endless summer with your friends and family. ​Its steps are molded to be rust-resistant. ​It has rubber bumpers that are fitted to the ends to protect the pool wall. ​It has a non-slip footstep which could be additional precautions for your safety. ​It is designed for easy installation. ​This pool handrail and ladder system are not recommended for saltwater swimming pools. The Arksen in-ground ladder and handrails are perfect for commercial and residential use. Its non-slip footsteps are the star of this ladder and handrail system. This is an ideal pool installation investment for you which can provide you the extra support and security you need when entering and exiting your pools. The hand pool rails might just be a normal accessory in a swimming pool but it sure does a lot for the pool users safety. It seems so simple that you might just want to ignore it completely or take its function for granted. However, handrails need as much attention as you give to your pool's overall condition. So, if you are looking forward to building your own swimming pool, consider this additional equipment or tools that you might need for taking care of your pool's rails and ladders. ​Anchors and escutcheons for installation purposes : Anchors are designed to have a wide flange on top of it to protect your pool's deck or concrete and it is used to hold the cover securely with more lateral strength. Escutcheons, on the other hand, are flat pieces of metal for added protection and in-ground strength. These are needed for initial installations and are sometimes not included in handrail sets available in the market. Handrail covers : Handrail covers are soft covers that zip over stainless steel pool handrail. This is needed to prevent you from getting burnt from hot handrails from intense heat from harsh ultraviolet sunlight and can prevent you from slipping due to oily hands.These are just some things you would need to consider when it comes to the importance of getting hand pool rails. You might take the inherent and simple nature of this technology for granted, but once without it, you can risk the overall safety conditions of your pool. True enough, it is better to be safe than to be sorry. Aside from that, ADA requires these safety measures when designing and building residential and commercial swimming pools to avoid accidents from happening. 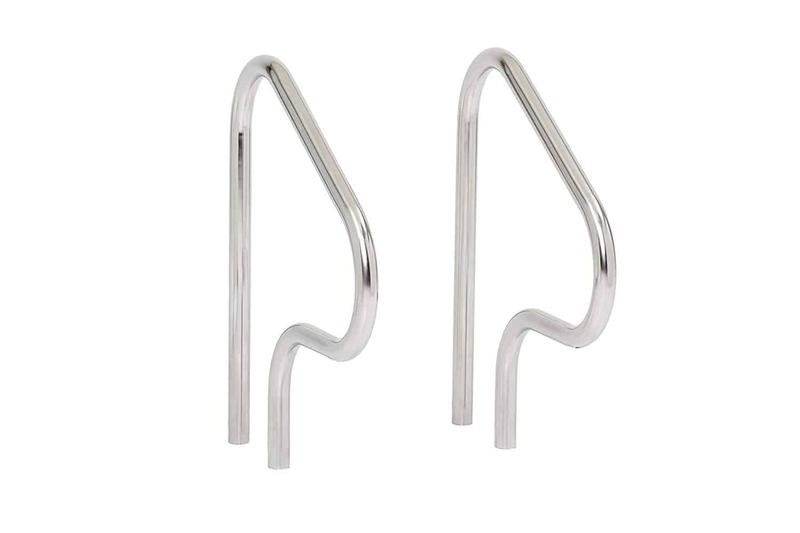 Simply put, whenever you go in and out of your pool, pool handrail got your hands.